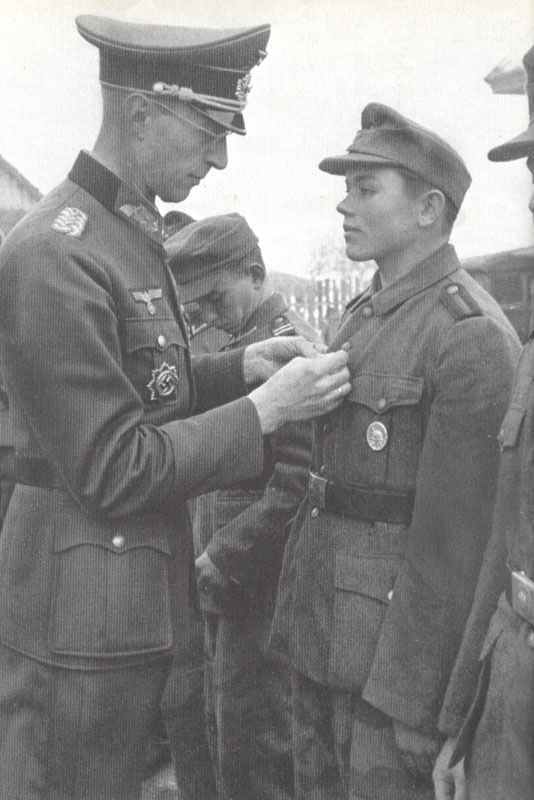 Decoration of Baltic soldiers and auxiliaries in German service. On 22 June 1941 the Red Army’s 29th Corps (Baltic Special Military District) disintegrated. The two divisions (the 179th and 184th ?) were ex-Lithuanian Army Divisions. The mutinied, killed most of their officers and commissars, then declared themselves a new Lithuanian Army.The hole they leave in the Russian line let a German Panzer corps drive on Kaunas, which 6,000 troops from the former 29th Corps had already captured. The Germans disarmed them and gradually used them as Einsatzgruppen forces, prison guards, etc. It is also believed that two ex-Latvian divisions disappeared as well, and possibly one ex-Estonian Division. The inhabitants of Estonia, Latvia and Lithuania were used by the Germans in various ways. A large number of Estonians, for example, were recruited by the German 18th Army to carry out security duties in the rear areas. On 1 January 1943 Estonian troops were reorganized into Estonian Company 657 and Estonian Battalions 658-660, transferring to the Waffen-SS on 24 April 1944. From February 1944 six Estonian Frontier Regiments (1-6) were formed to defend Estonia, disbanding in September 1944. The first contribution of the Lithuanian nation to the German war effort was the formation in April 1943 of Lithuanian companies attached to German Army construction battalions. Twenty battalions with a total of 12,000 Lithuanians also served with the German police in the so-called Schutzmannschaften. In September 1943 the Luftwaffe began to form Latvian units which in August 1944 were brought together to form the Latvian Aviation Legion. The Legion was composed of three night bomber squadrons (equipped with captured Russian Polikarpov Po-2), an aviation school and an anti-aircraft battalion, and various supporting units. Total personnel strength was about 628 men. In August 1944, 5,500 conscripts who had been found unsuitable for front duty were transferred to the Luftwaffe as war auxiliaries (Luftwaffen-Kampfhelfer) and were taken to Germany and distributed amongst various Luftwaffe units. In the same month the Latvian Youth organization was ordered to call up youths born in 1928 and eventually about 4,000 youths, and later 1,000 girls became another category of Luftwaffe auxiliaries. Tagged 1944, russia, volunteers, wehrmacht.